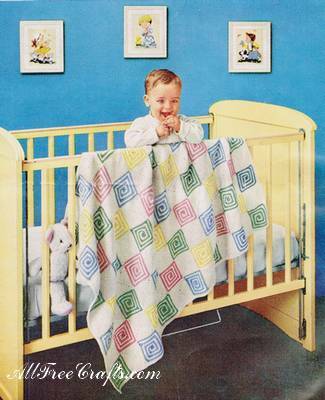 It’s difficult to believe that the cute little baby in this photo is now about 60 years old, but the baby blanket shown in his crib was originally designed for J&P Coats and Clark, circa 1952. With a motif that looks surprisingly modern, and a cheerful combination of colors, this is a blanket that would look good anywhere. The finished project measures approximately 32 x 46 inches. GAUGE: Each motif measures 3½ inches square. COLOR MOTIF … Starting at center with Nile Green, ch 2. 1st Rnd: 8 sc in 2nd ch from hook, drop loop from hook. Hereafter work in back loop only. 2nd Rnd: Leaving Green loop free, attach White to first sc, sc in same place, * 3 sc in next sc, sc in next sc. Repeat from * around, ending with 3 sc in last Green sc, drop White. 3rd Rnd: Pick up Green loop and, leaving White loop free, sc in each sc around, making 3 sc in center sc of each 3-sc group, drop Green. 4th Rnd: Pick up White and repeat last rnd. 5th, 6th and 7th Rnds: Work as for last rnd, alternating colors, ending with a Green rnd. Join and break off. Make 17 more Green Motifs, 17 Blue and 12 each of Pink and Maize (for a total of 59 color motifs). WHITE MOTIF (Make 58) . . .
Work as for Color Motif, using White only. Sew together (1 Green, 1 White, 1 Blue, 1 White) 3 times and 1 Green Motif (13 Motifs on row). SECOND ROW … Sew together (1 White, 1 Pink, 1 White, 1 Maize) 3 times and 1 White Motif. Sew First and Second Rows together. Sew together (1 Blue, 1 White, 1 Green, 1 White) 3 times and 1 Blue Motif. Sew Third Row to Second Row. Sew together (1 White, 1 Maize, 1 White, 1 Pink) 3 times and 1 White Motif. Sew Fourth Row to Third Row. Repeat first 4 rows once more, then First Row once again, joining as before. 1st Rnd: Attach White to back loop of any sc on long side, sc closely around, making 3 sc in center sc of each 3-sc group at corners. Join. 2nd Rnd: Sc in back loop of each sc around. Join and break off.